Japanese publisher Square Enix admits it needs to focus more on quality, as underperforming games prompt delays. 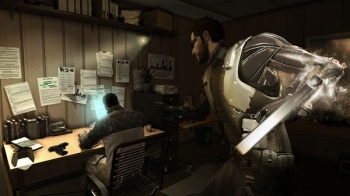 Square Enix has pushed the release of Deus Ex: Human Revolution back from its first quarter 2011 release window until the next financial year, meaning that the game won't come out until April at the earliest. This is the second high-profile game that Square Enix has shunted into FY2011, following the indefinite delay of the PS3 version of Final Fantasy XIV. Square Enix blamed the delay on the poor critical performance of a number of big releases this year. In a statement, it said that the company had realized that game quality should be its top management priority, implying that it thought Human Revolution needed more polishing before release. It also slashed its earnings projections for the year by nearly 90%, from ¥12 billion, or nearly $143 million, to just ¥1 billion, or roughly $12 million. Square Enix will talk more about the situation in a news conference in Tokyo later today with Square Enix CEO Yoichi Wada in attendance. It's unlikely that any single game has caused this dramatic cut in projections, but it's not hard to imagine that the lion's share of blame lies with Final Fantasy XIV. Unfavorable reviews will have hurt sales, and the game hasn't been generating the revenue that those estimates will have included, because Square Enix hasn't been charging players the $12.99 monthly fee while it irons out the kinks. What's more, the delay on the PS3 version, which is to allow Square Enix to get everything working before release, means that it has to wipe those potential sales off the board as well.